Babies make all kinds of noises, from contented sighs that melt your heart to high-pitched wails that pierce your eardrums. Grunting is part of each baby's audio repertoire, a sound that can mean anything from a cheerful desire for communication to a sign of serious illness. Like any other baby noise, mom and dad should listen to the details in order to figure out just what the grunting means. Babies grunt while having a bowel movement, notes pediatrician Doctor Hull on his parent resource website. This is because the undeveloped muscles of a baby's abdomen need help pushing stool out. Grunting closes the larynx and pushes down with the diaphragm, providing that help. "Baby 411" author Ari Brown notes that long periods of grunting might indicate constipation, especially if accompanied by a red face. Hull and Brown agree that grunting is sometimes just a random noise. 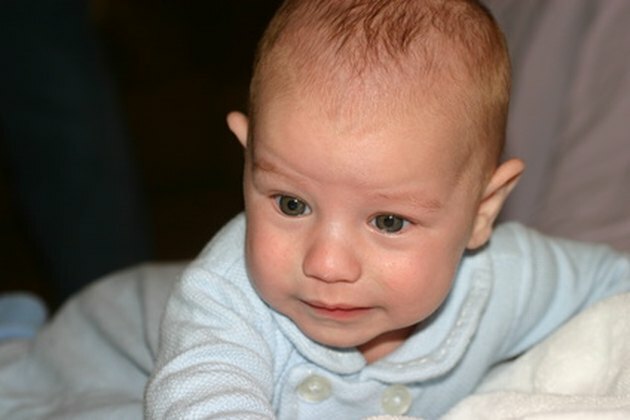 Babies love making noise, especially as they become aware that parents pay attention to people who make noise. Along with squeals, laughs and babbling, grunts are among a baby's first attempts to communicate and self entertain. If the grunt seems to be a reaction to an external stimulus, or an integral part of a stream of noises, it's likely just your baby making noise. Dr. Hull reports that babies sometimes grunt for the same reasons adults sigh or yawn. During shallow breathing, the alveoli in the lungs can collapse. This is normal, nothing to worry about and something that happens in adults as well. In adults and older children, a yawn or sigh floods the lungs with oxygen and reopens the collapsed alveoli. Babies have yet to develop those reflexes, but grunting does the same thing. Typically, this will be a single grunt followed by a few deep breaths. Hull warns that grunting can be a sign of lung problems, sepsis, meningitis or even heart failure. This kind of grunting is very different from healthy grunting, often coming at regular intervals or even with every breath. This grunting will seem labored and may be accompanied by wheezing or bubbling sounds during normal breathing, writes Brown in "Baby 411." If your baby exhibits this kind of breathing, take him to the doctor as soon as possible. This kind of grunting accompanied by a fever, or blue coloration around the lips, is cause for an ER visit.